Why is Tesco beefing up its finance team? The struggling supermarket chain is expected to offload a raft of assets. In a sign that Tesco is preparing to offload more of its subsidiaries, the FT reports today that the struggling supermarket is on the hunt for a new head of corporate development who will concentrate on investment opportunities and M&A. Since its fortunes began to tank last year, analysts have warned that Tesco need to trim the fat from its balance sheet if it wants to turn things around. Earlier this month its credit rating was cut to ‘junk status’ by Moody's just hours after its CEO Dave Lewis set out plans for a turnaround. Now Lewis has hired headhunters who have reportedly approach several bankers about heading up a corporate finance team, which would report to him, FD Alan Stewart and head of strategy Benny Higgins. It's thought the finance team is being beefed up in anticipation of a planned sell-off of assets, of which Tesco has many. Lewis has already chopped Tesco’s content company Blinkbox into three, selling off its movies arm to TalkTalk and its music arm to Australian company Guvera. There are reports Waterstones is planning to snap up its books division. Lewis is also considering a more substantial sell-off of data company Dunnhumby, which operates Tesco Clubcard. Today it emerged that several private equity firms have approached Keith Mills, who created the Air Miles and Nectar Card loyalty schemes, about fronting a bid for the business. Other options on the table include a sale of its Asian assets. Tesco has more than 1,700 Tesco Lotus stores in Thailand and 400 Homeplus stores in South Korea., as well as a strong presence in Malaysia. 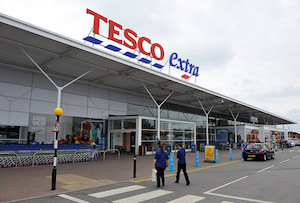 Analysts believe a sale could be worth between £8bn and £10bn, but Tesco could also consider floating its Asian brands, allowing it to retain a decent stake. A minority stake in Tesco Bank could also be up for grabs and there are suggestions Tesco could offload its Giraffe restaurants and Harris and Hoole restaurant chain. This would be a massive statement of intent for the chain - the businesses were acquired in a move to make Tesco more of a 'lifestyle' brand, and getting rid of them would seem like a lurch back to the basics. All credit to Lewis, who became Britain’s most talked about chief executive after just a few weeks in the role. Although it was down by 1.21% to 233.46p this morning, Tesco’s share price is now above where it was when, in September, he was forced to announce it had overstated its profits by more than £250m. For now, at least, it seems the City has some faith in him to get Tesco back on track.